Beginning on Tuesday, April 23, the Lewis Street crossing at Elgin will need to temporarily close for up to two weeks to accommodate deep sewer and water work. To access Jack Purcell Community Centre and services, cars can cross over Lewis at Elgin to enter Jack Purcell Lane, right to the front of the Centre. Parking will remain available to patrons of both the pool and the centre. Cars can exit onto Frank Street, which will be two-way during the construction. 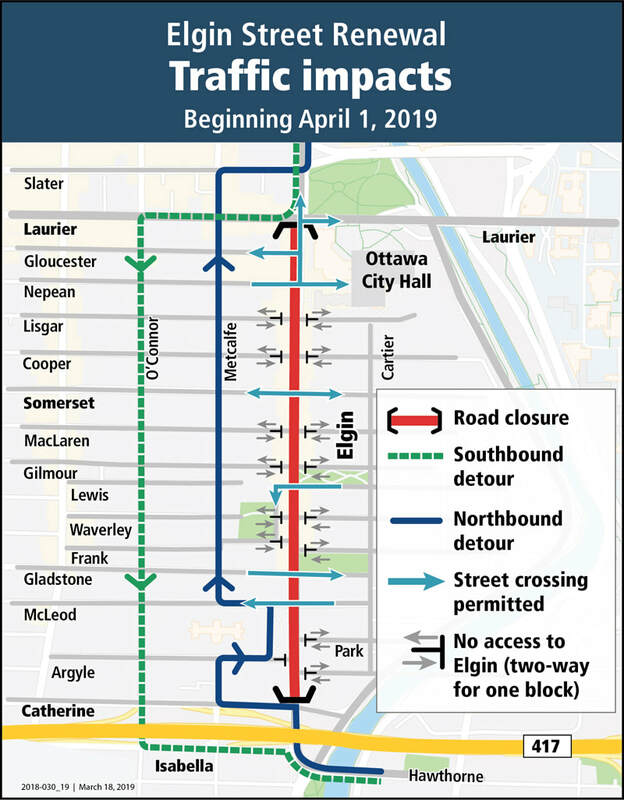 Beginning on Monday, April 1, the southbound lane on Elgin Street from Laurier Avenue to Somerset Street will close, completing the full closure of Elgin Street from Laurier Avenue to Catherine Street. Traffic, transit and cyclist detours are in place. The City will continually review these detours to ensure they are working effectively. 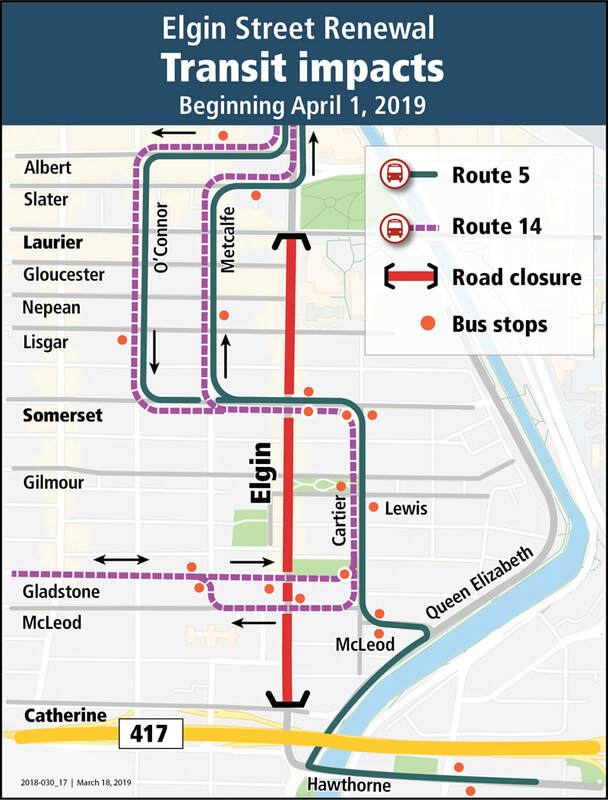 The Elgin Street closure will result in traffic and transit impacts. The City asks for your patience and to plan ahead and expect delays. ​Sidewalks will remain open for pedestrians. Pedestrians will be able to access businesses on both sides of Elgin Street at all times. The JPRA team is available during this time for any questions or concerns that you may have regarding the construction and accessing services at the centre! We are losing access to the Community Centre VIA Lewis Street from March 11-15, 2019. 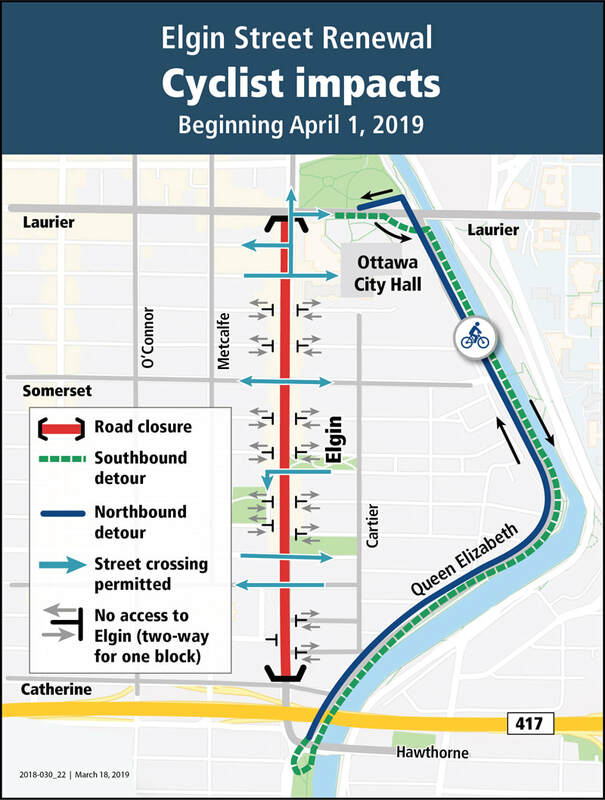 The Elgin Street renewal project starts Monday, January 7, 2019, and is expected to end on December 31, 2019. Pedestrian walkways and shops will remain open during this time! To access Jack Purcell Community Centre and services, cars can cross over Lewis at Elgin to enter Jack Purcell Lane. Parking will remain available to patrons of both the pool and the centre. Cars can exit onto Frank Street, which will be two-way during the construction. Aldo became a certified group fitness instructor in 2004 when he was advised he had high blood pressure. Fitness is a way for him to promote and maintain his own good health. 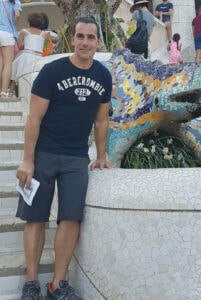 In 2009, Aldo joined the JPRA fitness program as the Monday evening step/cardio instructor, which was the only type of class he taught early in his fitness instruction. Over the years, he has expanded his range to include cardio circuit, Tabata, interval training, and weight and strength training. Aldo’s favourite workout is weight training and he teaches his class at a high intensity level. He encourages his participants to challenge themselves and to move their intensity level up in each class. He also likes to build in some unpredictability in his classes. Just when you think you’re finished with that routine . . . .! And, of course, he may use a short simple round of stepping to get you warmed up. In 2012, Aldo became the Coordinator for JPRA’s Fitness Program, a position that he holds today. He creates seasonal fitness sessions that provide a workout for everyone, regardless of their fitness level. He ensures that qualified and committed instructors are available to teach in the program. Whether its weight lifting, stepping, cardio moves or Tabata, Aldo wants new participants to understand that “you and your body have to learn how to do cardio moves and how to lift weights correctly. Give yourself time. This is a commitment.” He has made the commitment for over 14 years now. One area that Aldo enjoys most about fitness is building relationships with participants over a long period and developing a social connection with his participants. Many people have been attending his classes for several years, coming back for the challenge he offers in each of his classes, pushing you to take your workout to the next level. ​Aldo’s favourite post-workout meal: Chicken, roasted sweet potatoes. He doesn’t actually watch what he eats! Peter is both a certified group strength fitness (for over 10 years) and Mossa Core instructor (a workout offering a new training techniques). He also teaches group fitness to the visually impaired for the City of Ottawa at the Jack Purcell Community Centre. Peter took up fitness as a way to relieve the tension in his high-stress job. He decided that he wanted to be an instructor after taking several core and strength classes at the YM-YWCA. He also does triathlons, half marathons and is an avid cross-country and alpine skier. He bikes, he swims, he trains, and he does the annual 3K Bring on the Bay nonstop swim across the Ottawa River. Peter first joined JPRA as the early-morning Boot Camp instructor in October 2011. In fall 2017, he taught a Tuesday evening Total Body Strength-Core class as part of the Fitness Program. He loves adding variety in his workouts offering circuit training, sports conditioning, Tabata and strength training. He also likes to introduce lots of equipment or fitness “toys” as he calls them, setting up the room with different equipment from his bag of toys. He’ll also add partner group workouts that move the intensity level up another notch in his classes. Because his favourite type of workout is core, Peter dedicates at least 15 minutes of each class that focuses on working core/abdominal muscles. He likes to coach and uses a down-to-earth and enthusiastic approach in his teaching style. The bottom line for Peter: he wants participants to have fun, enjoy themselves , have a good workout and be introduced to as much variety in the workout and in the range of equipment that he can fit into each hour. His favourite post-workout meal: “depends on the workout and how hard you worked.” But soon after a race, Peter always ensures a good protein intake as part of his recovery process.